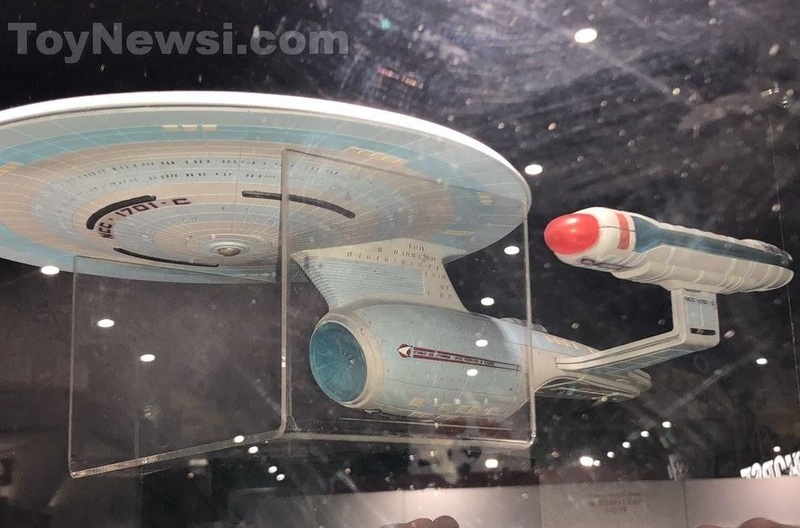 The Trek Collective: Diamond Select Toys reveal USS Enteprise-C, plus Kelvin timeline and Borg figures! 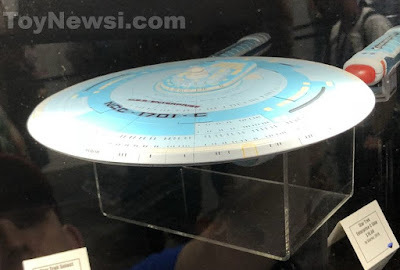 Diamond Select Toys reveal USS Enteprise-C, plus Kelvin timeline and Borg figures! But where's the Reliant I hear you yell... Well, not here yet! In fact, as previously reported, DST apparently have two new ships they expect to release before the Reliant, so we can look forward to another new reveal too at some point - They said they weren't counting variants in that number, so I'm sure we can expect a battle damaged Enterprise-C on top of that as well at some point! Maybe the next new items could be a clue to possible coming ship? Because yes also on display are DST's first ever Kelvin timeline products! Captain Kirk and Spock were revealed, and surprisingly they've gone for Star Trek Into Darkness (rather than more recent Star Trek Beyond) versions of the characters. Both will be part of the Star Trek Select range, and come with accessories including phasers with phaser-blast attachments! These two are expected to arrive as soon as December this year! 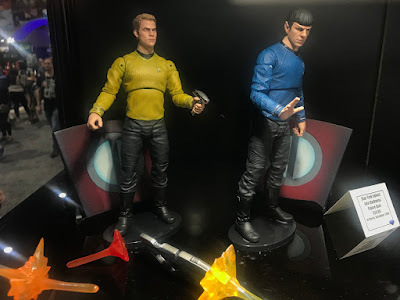 Images of these come via TrekMovie and Figures.com, who again have more to offer in their galleries. 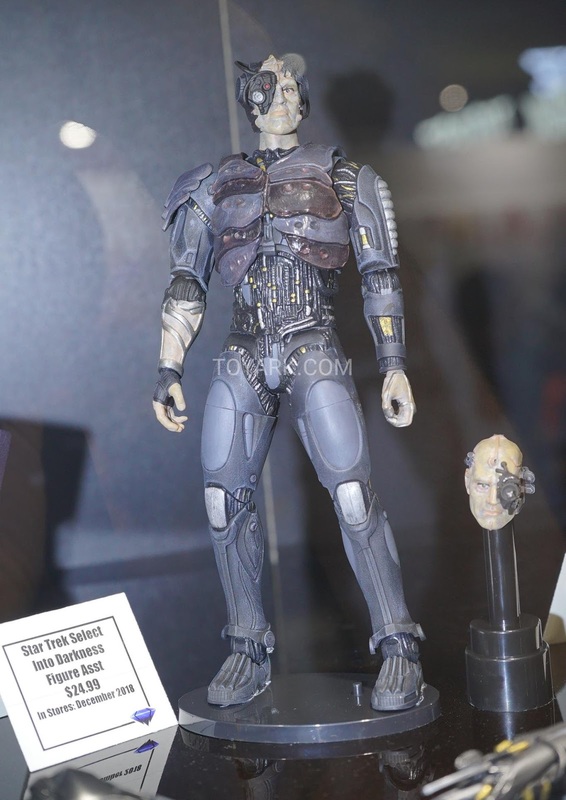 Finally, also coming to the Star Trek Select range is a figure we've known has been in the works for some time, but are only now getting to see, the new Borg. This is a generic drone, with two different heads to choose from, and optional arm attachments too (which sadly are only displayed next to the figure rather than on the arm; I suspect it will look much cooler with that bit of added technology and asymmetry). This chap will be turning up winter next year. Images via ToyArk and Figures.com. To keep track of all the latest Star Trek toy releases, kit the Models, Toys, and Games button on my 2018 schedule page. And for listings of various Star Trek toy ranges, see my Trek Collective Lists site. Funny thing, those Kirk and Spock figures. They said a while back that they didn't have the license to do products from the Kelvin Timeline, which was why they hadn't done the Enterprise yet. But now...could an actual, affordable, great toy of the KT USS Enterprise be on the horizon?? I certainly hope so! They Playmates one is a joke!